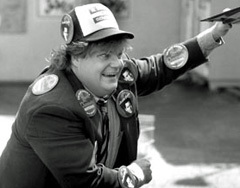 A new exhibit at the Wisconsin Historical Society&apos;s museum details the life of Wisconsin native, comedian Chris Farley. The exhibit opens in conjunction with the release of a new biography, The Chris Farley Show, co-written by his brother Tom Farley. “My mom&apos;s had this . . . storage bin in Madison with all this stuff,” said Tom Farley. The family was approached by the Wisconsin Historical Society, because of his brother&apos;s links to the state. Farley was born in Madison in 1964 and went to Marquette University in Milwaukee before heading to Chicago and joining the famous Second City Theatre troupe. He starred on Saturday Night Live and in movies before his death in 1997 at age 33 from an accidental drug overdose. The exhibit runs through November and uses many of the props from Farley&apos;s professional life as well as articles from his personal and private life through the various stages of his life and career.